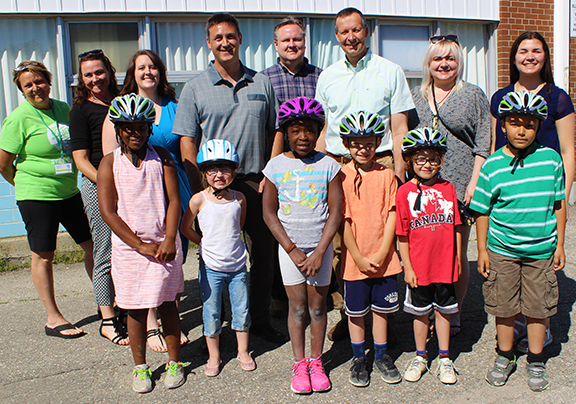 KITCHENER, ONTARIO – On Tuesday local representatives of the Ontario Trial Lawyers Association (OTLA) visited Rockway Public School where they handed out more than 40 bicycle helmets to grade two and three students with the assistance of the Brain Injury Association of Waterloo Wellington. 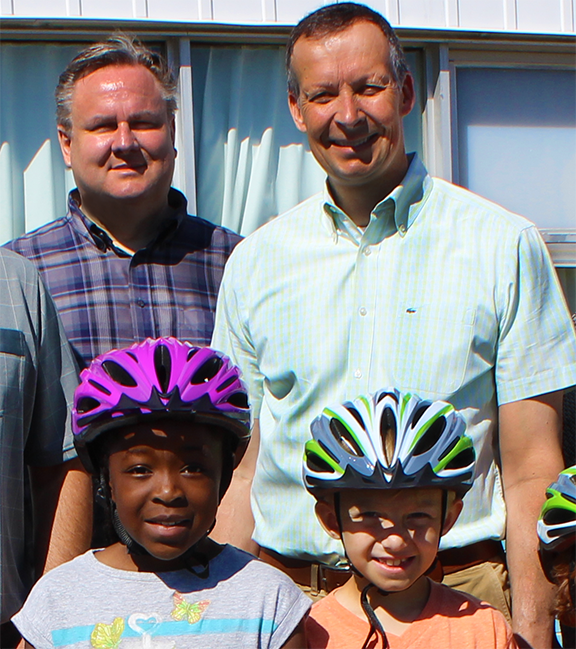 Paquette Travers & Deutschmann and Dietrich Law are two Kitchener based personal injury law firms and members of the OTLA’s Bike Helmets on Kids campaign. This year, the entire campaign will help distribute an estimated 4,000 bicycle helmets to children in cities and regions across Ontario. “We are pleased to be able to give back to the community in this way. Head injuries are a leading cause of injury and death for young people. A properly fitted bike helmet is key to helping to reduce the number and severity of head injuries for children” says Rob Deutschmann and George Dietrich, both personal injury lawyers, committed to helping those who have been injured. George Dietrich and his daughter Lizzy; along with Rob Deutschmann and his daughters Ariel and Kelsey, along with members of their local legal teams pitched in to deliver and fit the helmets for the students. Kim Knispel lead the team helmet fitters to make sure all the helmets fit each child properly. The local Lidz on Kidz safety educator and brain protector advocate also sat the helmet recipients down for a 15 minute lesson on the vulnerability of our brains and the importance of wearing a helmet everytime we cycle. Kim also stresses the importance of parents and adults being good role models by also wearing a helmet each time they cycle with or without their children. As adults, we need to show children that our brains need to be protected. OTLA’s Bike Helmets on Kids campaign was started by OTLA members in 2002. Since its first event, held in London, Ontario, more than 19,000 helmets have been distributed to elementary school students. The mandate of the campaign is to put a helmet on the head of every child who needs one, and provide education and awareness to school-aged children about bicycle helmet use. All helmets are purchased with funds donated by OTLA lawyers and their firms. According to the Canadian Institute for Health Information, cycling injuries are by far the most common injuryfrom summer sports and recreational activity, accounting for half of all hospital admissions. Among the most severe cycling injury admissions of the past decade (those requiring admission to a special trauma centre), 78% of those hospitalized with a head injury were not wearing a helmet when their injury occurred. 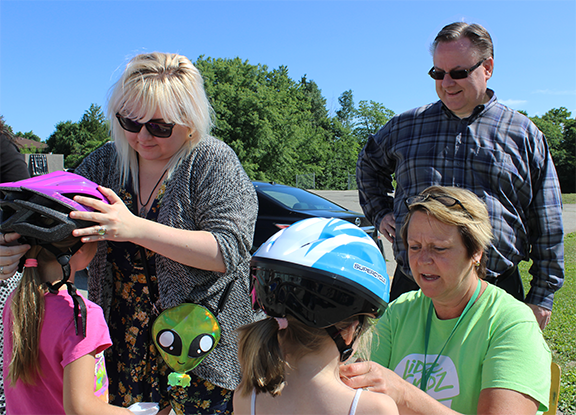 This year, Bike Helmets on Kids events are taking place in communities across Ontario. Each event is also supported locally by a number of community partners, such as school boards, local public health departments, regional chapters of the Ontario Brain Injury Association,provincial and local police, hospitals and other safety associations and organizations committed to brain injury awareness and treatment. 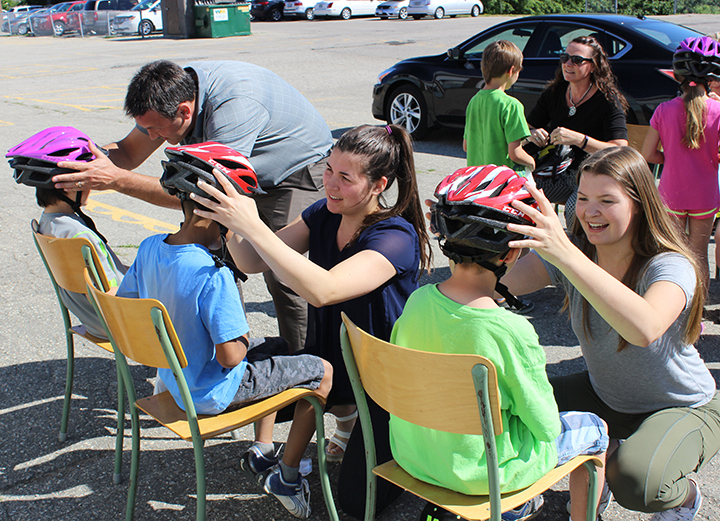 The Bike Helmets on Kids campaign has been recognized with awards from the Brain Injury Association of Canada (BIAC), the Ontario Brain Injury Association (OBIA) and the Ontario Safety League (OSL) for its contribution to promoting injury prevention awareness and safety education. (Left) Local Lawyers George Dietrich and (right) Rob Deutschmann believe in safety first when it comes to cycling and protecting your brain. About the Ontario Trial Lawyers Association: Founded in 1991, the Ontario Trial Lawyers Association (OTLA) is an organization of more than 1,450 plaintiff lawyers, law clerks, articling students and law students. Our purpose is to promote access to justice for all Ontarians, preserve and improve the civil justice system, and advocate for the rights of those who have suffered injury and losses as the result of wrongdoing by others, while at the same time advocating strongly for safety initiatives. For more information, visit www.otla.com.